Speaking Daggers officially selected for the Shakespeare Birthplace Trust’s Shakespeare Film Festival in UK! We are delighted to announce that the short film, Speaking Daggers, which grew out of the Shakespeare Republic universe, produced by Incognita Enterprises in conjunction with Independent Schools Victoria and released at the inaugural Arts Learning Festival at ACMI in May this year has received it’s first film festival official selection! The film will have it’s UK premiere at The Shakespeare Film Festival, run by the Shakespeare Birthplace Trust as part of the Filming Shakespeare: Crossing Borders Short Film showcase in Stratford-upon-Avon on Saturday, September 23rd! Additionally, the film has received a “Highly Commended Finalist” from the Jury President, Sir Kenneth Branagh, and is a finalist in the “Films inspired by Shakespeare” category. All “Highly Commended” and winning films selected by Festival Patron, Sir Kenneth Branagh and the jury, of which Speaking Daggers is one, will screen on the site of The New Place, Shakespeare’s last home in Stratford on the evening of September 23rd in an open air cinema set up especially for the event. We are so over-the-moon that this will be Speaking Daggers debut on the international film festival circuit and congratulate all our cast and crew on this success! 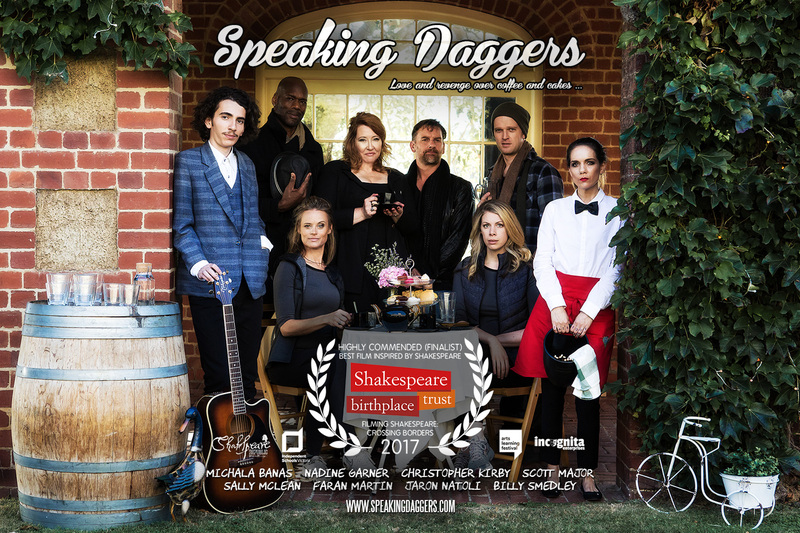 Speaking Daggers features performances from Michala Banas, Nadine Garner, Christopher Kirby, Sally McLean, Scott Major, Faran Martin, Jaron Natoli and Billy Smedley. Cinematography by Shaun Herbertson. Sound Editing & Design by Tim McCormick. Directed by Sally McLean. Produced by Sally McLean & Billy Smedley. Filmed on location at Toorak College, Mt Eliza, Victoria. Posted On 26/08/2017 in Project Updates, Screenings & Festivals with 0 Comments.Tagged: film festival, official selection, screening, short film, Speaking Daggers. ← Shakespeare Republic officially selected for the Festival de Cine de Fuengirola!